Worms – serpents or dragons – were defeated heroically, not only by St George, but in legends of local families. Lord Lambton overcame the Lambton Worm – a feat later celebrated in a local music hall song – and Sir John Conyers slew the Sockburn Worm with his falchion – the very one, legend has it, that still belongs to Durham Cathedral. The Lambton Worm is today the best-known of the Durham dragons. However, the story seems to have gained real popularity only during the first few decades of the 19th century; during the late medieval and Early Modern periods the Sockburn Worm reigned supreme. A young knight named Sir. John Conyers fought to save his lands from a great dragon who had haunted the region for seven years. After offering his prayers at a nearby chapel, Sir John slew the foul-breathed serpent with his trusty falchion, letting its decimated body rest in the River Tees. He buried what was left of the beast under the great ‘Grey Stone’ still visible today, and received the lands of Sockburn for his efforts from the Bishop of Durham. Over the centuries, worms and dragons have continued to feature in local lore and performance. Listen to some of these stories in this podcast by John McKinnell. 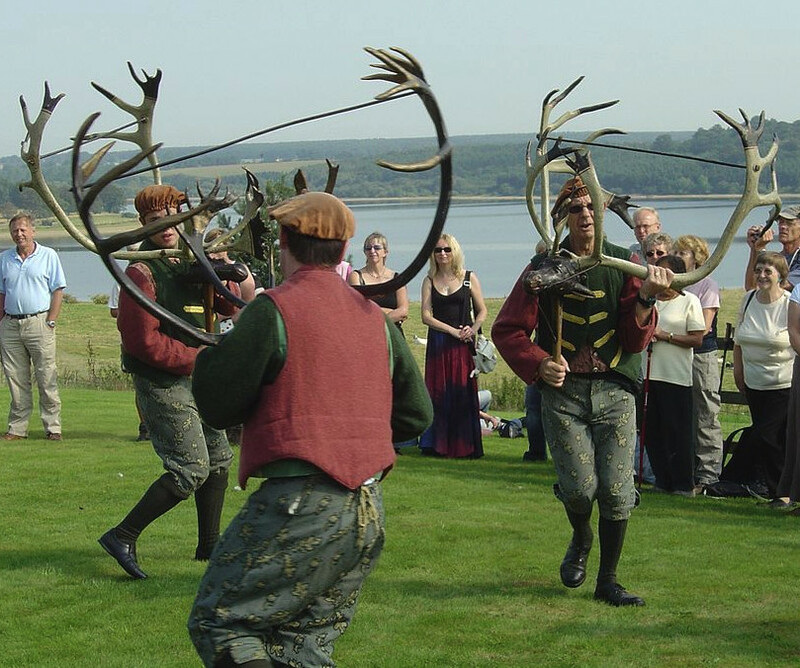 Stags feature in performances harking back to folklore. According to Robert Graystanes’ 14th century Chronicle, Lord Neville of Raby claimed the right to enter Durham cathedral every Holy Cross Day (14th September) with his foresters blowing their hunting horns, and make an offering of a recently killed stag on the high altar; but the pagan echoes of the custom offended the Prior and it was abolished. In the North-East as in other parts of England, animal impersonations also celebrated Plough Monday, the first day of work after the Twelve Days of Christmas. Robin Hood, though we usually associate him with Nottingham and Sherwood Forest, seems to have got around: not only featuring in ‘The Durham Song’, he also crops up in records from Brandsby, North Riding of Yorkshire. 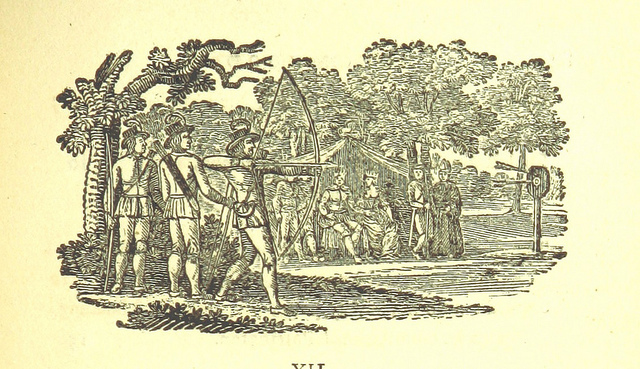 George Sherwin was reported to the Bishop’s Court in 1615 for playing Robin Hood at a rush-bearing ceremony, when traditionally a procession of parishioners carried fresh rushes into the church, often with music, dancing, and in this case a folk play. The point is that it happened on a Sunday, when such irreligious customs were forbidden: it does often happen that we only find records of performances when the performers were breaking the law! Other folk plays – Mummers’ plays and others – have traditionally been held at Christmas and New Year, and May Day was also an occasion for songs, processions and competitive performances between parishes, often featuring Robin Hood for young men and, here in Durham, a Young Maids’ Procession for young women. Both appear in ‘The Durham Song’, a surviving treble part from a five-part musical work that describes local festivities in the sixteenth century. The words are incomplete, but very evocative! the bayly beryth the bell Away. Many early plays were really part of Christian worship (liturgy) rather than independent dramas, so we cannot be sure about dates; but the earliest serious contender for the title of ‘oldest play from Britain’ is the Harrowing of Hell in the ninth-century Book of Cerne, now in Cambridge University Library. It is thought to have been composed at Lindisfarne around 740 – and so may be from our region. The action, based on the apocryphal Gospel of Nicodemus, tells how, after his death on the Cross, Christ descended to Hell to redeem the virtuous souls who had lived and died before his time. The play is in Latin and incomplete, but luckily a more complete version survives in Old English, featuring a lively prologue in which the devils lament Christ’s arrival in Hell. Find out more about the history of the Harrowing of Hell, and how the REED NE team set about producing the first performance of the play in modern times. A much more developed and sophisticated early play from the North-East is Peregrini (‘Pilgrims’) by Lawrence, Prior of Durham (died 1154), which is in a manuscript of Lawrence’s poetic works in Latin, now in Durham University Library. This play, probably written for performance on Easter Monday in Durham Cathedral, dramatises the biblical episodes of the risen Christ’s appearance to the pilgrims on the road to Emmaus and to the apostles, including doubting Thomas. Unlike other early plays on this subject, Lawrence’s is in gifted and inventive verse, shows the apostles as individual characters and even suggests that Thomas’s doubts may have been useful! Discover the background to this wonderful early play, with its haunting music.